Introducing - Monica Rule. Monica joins Law Central as a Bulletin contributor after having worked for the Australian Taxation Office (ATO) from 1985 to 2013. During the past 17 years, she has worked as a technical advisor and trainer, as well as a senior compliance officer in the Superannuation Business Line of the ATO. As you know the ATO is the Regulator of Self Managed Superannuation Funds (SMSFs) and Monica has drawn upon her experience to publish a book – The Self Managed Super Handbook – and contribute columns to both the Australian and West Australian newspapers. During her time at the ATO, Monica has developed training packages for staff, presented external seminars for professionals, accompanied senior management on external presentations as a technical expert, and most importantly liaised with SMSF trustees, accountants, auditors and lawyers when auditing SMSFs. Monica received four awards for technical excellence for her work in superannuation and compliance. We are pleased to have Monica on our team of SMSF experts. It is without a doubt that the number of SMSFs have grown at a phenomenal rate over the past few years. According to statistics issued by the ATO, there are approximately 480,000 SMSFs with over 900,000 members in Australia. In Monica’s first Law Central Bulletin, we start with the potential structures of an SMSF. 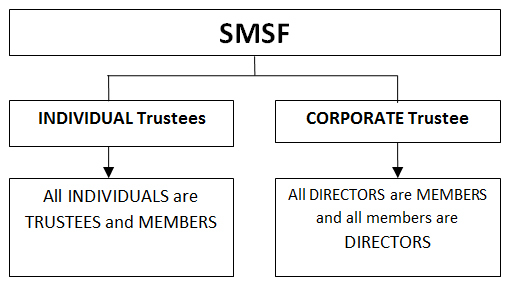 You can establish an SMSF under either an individual trustees’ structure or a corporate trustee structure. The chart below illustrates these structures. you cannot have any person in your SMSF who is an employee unless the person is a relative (however, there are exceptions to this last requirement which will be explained further). 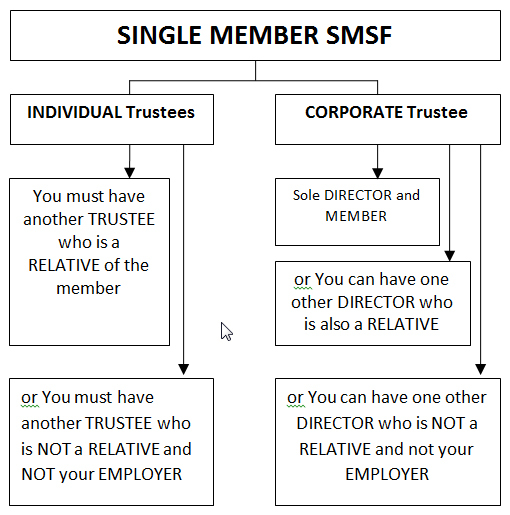 you cannot have any person in your SMSF who is an employee unless the person is a relative (I’ll explain this in more detail later). the two individual trustees do not receive any payment from the SMSF for performing their duties as trustees. The reason you must have two trustees for a single member fund under an individual trustee structure is because under the general trust law, you cannot be the sole trustee and sole beneficiary. You are effectively considered to be “wearing both hats at the same time” which creates a conflict of interest. the director(s) does/do not receive any payment for the performance of their services as directors in relation to the SMSF. any beneficiary (and his or her relative) of a trust that is a partner in the employer partnership. The reason for this rather inclusive definition of an employee is because when the Government first introduced SMSFs, it only wanted people who were related to each other to be in an SMSF together. However, this caused some problems for small businesses that wanted to set up SMSFs with members who were working together but were not related to each other. The SISA was changed to deem certain people as not being an employee so that they could establish an SMSF together. Gold and Platinum Members read on to see who is deemed not to be an “employee”. It’s important to establish a structure that not only suits your needs but also complies with the law. Getting it wrong can prove to be a costly exercise if the ATO asks you to rectify something or worse still – start over. To understand how the superannuation law applies to SMSFs, read my book The Self Managed Super Handbook: Superannuation Law for Self Managed Superannuation Funds in plain English (available soon from Law Central) .